When exactly OneCoin began to run out of money is unclear. By January, 2017, however, affiliate withdrawals exceeded new investment such that the internal exchange had to be shut down. Despite promises of an exploding coin value for over two years, effective January, 2017, OneCoin severed affiliates from their invested funds. Over 2017 OneCoin continued to solicit new investment, however without ROI withdrawals the business tanked. By the end of 2017 OneCoin had all but collapsed, with only a handful of extremely desperate affiliates left to toe the company line. Minus recruitment commissions, which were paid out directly, it is believed the majority of funds invested into OneCoin primarily benefited owner Ruja Ignatova and her family. In addition to a $20 million dollar property empire and $15 million dollar yacht, Ignatova is now building a new $2.5 million dollar coastal mansion. Ignatova’s new home is being built in the Bulgarian seaside town of Sozopol. Sozopol is a popular tourist town, with visitors from around the world flocking to the town during Bulgaria’s summer months. 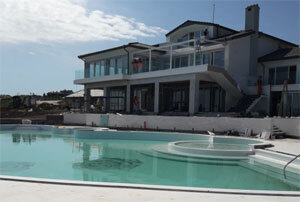 Ignatova’s new pad features a private beach, private vineyard, “huge pool” and children’s playground. Inside the house boasts “extremely expensive” custom-made furniture imported from Germany. Adjacent the mansion is a three-story building that once served as a hotel. Ignatova snatched that up as well and has turned it into a guest house. All up the mansion itself is estimated to have cost around $2.5 million USD. How much extra the guest house property and German furniture was is unclear. Despite Ignatova’s flagrant display of wealth at the expense of OneCoin victims, Bulgarian authorities themselves are not believed to be investigating either OneCoin or its founder. Ignatova went into hiding in mid 2017 and, apart from docking at Sozopol in her $15 million dollar yacht, has not been seen in public since. The total amount of OneCoin investor funds Ignatova and her family have squirreled away since 2014 is unknown. A week ago OneCoin’s Sofia headquarters were raided, as part of an ongoing German investigation into OneCoin. In response to the raid, OneCoin published an anonymously authored press-release on its website yesterday. Amid bleating about the unfairness of authorities not giving OneCoin time to prepare for the raid, the company raised the specter of bankruptcy. Presumptuous maybe, but I can think of one portly lady who might be able to spot them a loan.